Li Gan and her team investigated how microglial cells maintain their population. Microglia, the brain’s immune cells, protect brain cells from infections. They also nurture neurons over their lifespan and prune away excessive connections between neurons. The number of microglia and their distribution in the brain are normally stable—a phenomenon known as homeostasis. However, an excess of activated microglia, called microgliosis, is observed in most neurodegenerative diseases. Scientists have known for some time that microglia have the remarkable ability to regenerate and restore their population in mouse brains after having been nearly completely wiped out. But the origin of the microglia that repopulate the brain has been a controversial subject. Yet, understanding how microglia normally regenerate could eventually yield new strategies for tackling disease. 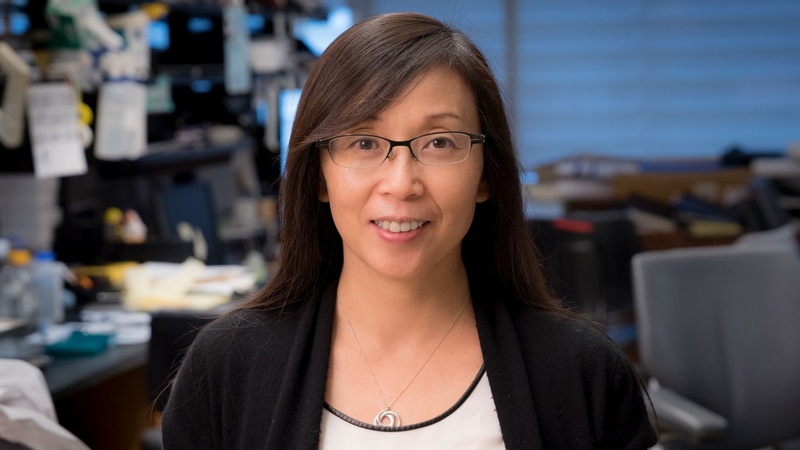 In a recent study published in PLOS Biology, a team of researchers led by Li Gan, PhD, senior investigator at the Gladstone Institutes, unlock the mystery of how microglial cells repopulate the brain. For their study, Gan and her colleagues depleted mouse brains of up to 90 percent of their microglial cells. This allowed them to observe how microglial cells repopulate the brain and eventually restore the network of brain microglia to its original density. Based on previously published observations, three possible sources for the repopulating microglia have been proposed. They could come from a special pool of brain cells expressing a protein called Nestin1, from a pool of immune cell precursors known as myeloid cells that originate in the bone marrow and circulate in the blood, or from the few microglial cells that remain after depletion. To distinguish among these possibilities, the study’s first author, Lihong Zhan, PhD, used a technique called lineage tracing. With this method, he added a different fluorescent marker to each pool of cells identified as potential sources for regenerating microglia. He then tracked each cell population to identify the one that actually created the new microglial cells. Upon initial observation, the regeneration of microglia seemed to resemble disease-associated microgliosis, but eventually resolved to homeostatic level, even after repeated depletion and regeneration. “We need to continue to investigate how microglial cells know to stop growing and remain within set boundaries in this setting,” says Zhan. Gan and her team made other interesting findings through this study. One such finding helps explains the regular and stable distribution formed by microglia in the healthy brain, which looks like a grid-like tiling pattern. To understand the origin of this regularity, the scientists used an innovative labeling method that allowed them to randomly distribute lineage-tracing markers of different colors among microglial cells. They then observed the distribution of colors in the brain after microglial regeneration. If regenerating microglial cells traveled far away from their progenitors, the different colors should mingle. Instead, they found that cells of similar colors formed clusters, suggesting that regenerating cells did not stray far from their parent cells. In addition, the researchers demonstrated that microglia are very long-lived. Their turnover rate is so slow that a mouse may only renew its microglia population five times during its entire lifespan. In humans, microglia can live for decades. This study was supported in part by the National Institute of Aging. Other authors include Grietje Krabbe, Meredith C. Reichert, Maria Telpoukhovskaia, Lay Kodama, Chao Wang, Seo-hyun Cho, Faten Sayed, Yaqiao Li, David Le, and Yungui Zhou from Gladstone; as well as Fei Du from the University of Wisconson, Madison; Ian Jones and Yin Shen from UC San Francisco; and Brian West from Plexxikon Inc.